It wasn't quite the experience I thought it would be ... all pretty ordinary really. And I don't feel any different. It was a massive perk finding out on the day I was flying down to Cape Town to see my family for the weekend tho :) So much nicer to share the news in person. So we hit the jackpot on Month 4. Pretty normal, I gather. I had joked with The Trucker at the beginning of the month that we'd better get pregnant this month as my period was scheduled to start during Oppi, and well, I can't really imagine a worse idea (part of why I was so keen on the Kreef Hotel and nearby toilet idea!). Since I've been tracking things and whatnot, I've been pretty much exactly clockwork with my ovulation and my period, if not on the day, perhaps the day before. On Monday last week I started to wonder ... but I wasn't getting my hopes up. I set Thursday as The Pee-Stick Day, trying not to get ahead of myself. I went to the loo frequently last week, as I had done the month before in my period week ... constantly checking if it had started or not yet. I can't remember if it was Tuesday or Wednesday that I began to think that this might really be it. I googled when the best time to do the Urination Test would be: A week after your missed period. Well who can wait that long? I get that it's probably smart, in case of an early miscarriage, you can just assume it was a late period and try not to be too crushed. But since we were flying down to Cape Town on the Thursday evening, there was no chance I was waiting that long. So on Wednesday I decided to go get the blood test done. There are two options, one pretty much like the pee-stick, which gives you a Yes or No, and another than can actually tell you how far along you are. I went with the more detailed option since I knew I was doing a pee-stick the following morning. And I worked from home on Thursday so I could go get my results. I told The Trucker about the blood test on Wednesday evening. And on Thursday we got a dark blue plus-sign on the pee-stick. OMG. This is real. But is still doesn't really feel real. Because it doesn't feel like anything, yet. 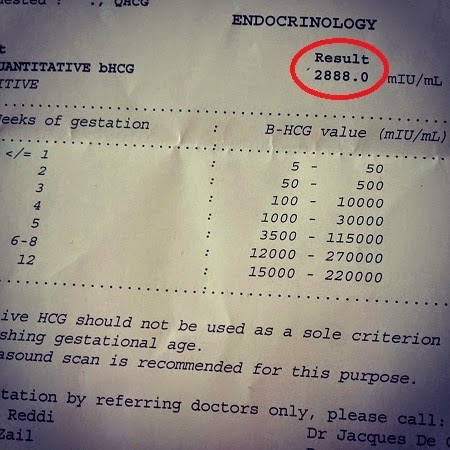 I went to get my blood results at about 10am on Thursday and it said I was 4 weeks pregnant. Well, I already knew that since I know exactly when my last period started. So I also know I'm due a week before my 35th birthday next year. Wow. I suspect we're in for a huge surprise and, of course, life will never be the same again ... but first we have 2 weeks in Turkey to get thru before I even have my first Gynae appointment. And, I reckon, until then it's all going to carry on feeling pretty unreal. Aside from the no-alcohol and no-sushi and no-pretty-much-anything thing ... that's a bit annoying ;) Haha. So happy for you, don't worry the excitement will come! Probably because you were planning on it and trying to conceive it isn't a big deal now, but when your bump starts growing and you feel a baby inside of you it will be totally exciting and nerve-wracking and awesome. My tummy did a little flipflop for you!! Congratulations!!!!!!! Join the club! I am 24 weeks, and I am impressed by how you tracked your ovulation etc. I had a vague idea when I ovulated, and then we went at it like bunnies :P it worked out though. I hope you don't get morning sickness! Thanks everyone. We are super excited too! 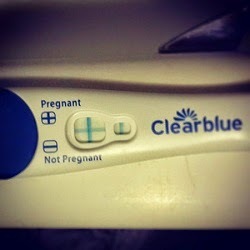 @po - we used those Ovulation Pee-Sticks for the last 2 months. Super easy peasy! I was planning to use those if it took longer than a month but we got it in one. I am very grateful for that. I don't have much patience for all the Two week waits and I know it takes months or years for some people. But if I do this again, I will try those out.